The Sparta pride was somewhere deep in the far end of Londolozi. The hideously thick section to the south of the Tugwaan drainage, where scarcely a game trail is to be found winding through the chest-high grass, sickle-bush and acacia thickets for which the block is known. A tracker’s kryptonite, we knew it was going to be a tough ask to find them, and with the autumn sun setting earlier and earlier each day, time was against us. So when Mike Sutherland radioed that he had heard kudu alarming not 5 minutes from camp, we decided to change our plan. Knowing the Mashaba female leopard had been stashing her cub in the Strip Donga on and off for the last few weeks (very close to where the kudu were barking), we radioed Mike and said we’d be moving into the area to give him a hand. We could hear Mike’s Land Rover bumping around in the thicket about 60m away, and as he was heading straight towards the track we were parked on, we knew we were only moments away from the leopardess and her cub coming into view. Knowing the cub to be skittish, we were hoping for a few brief glimpses as it tailed its mother, most likely keeping to the edge of the thicket line. What we were not expecting was what happened next, as both the animals sauntered out of the bushes and onto the track in full view, and casually strolled past our vehicle while we held our collective breaths. 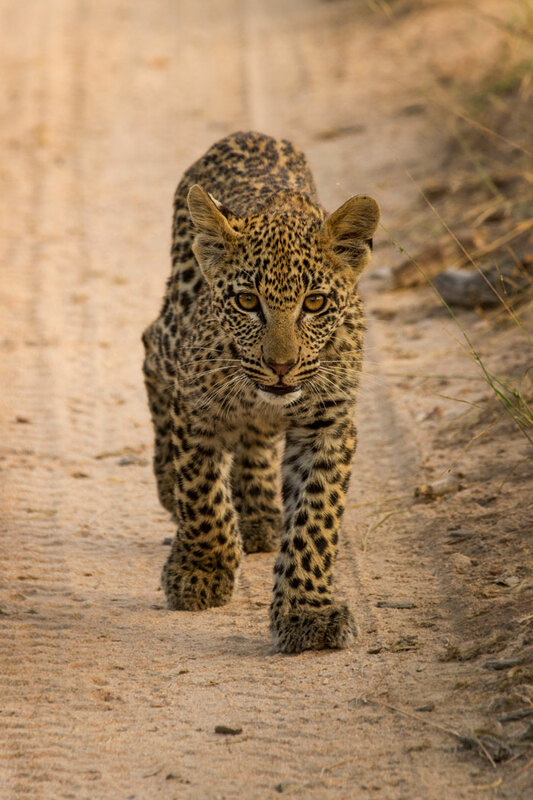 The little cub, finally habituated, had scarcely spared us a glance as she walked past within two metres of my feet. A very special moment! So began the most incredible sighting in which the mother and cub let us follow them around for well over an hour, staying right out in the open. 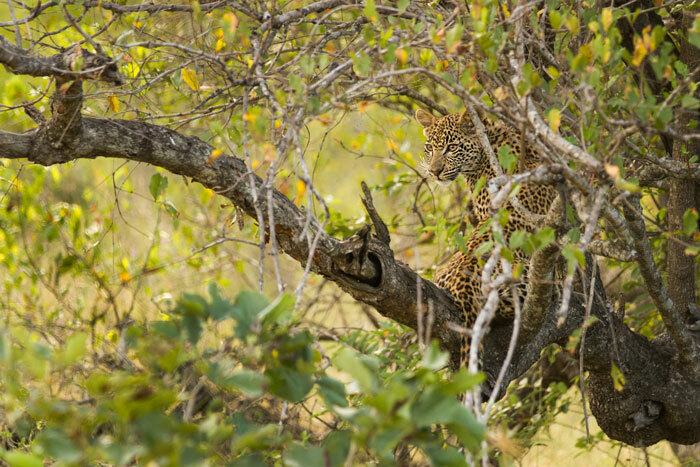 For such a secretive species as the leopard, this was unusual, especially given that the cub is still young and it is the Mashaba female’s first, which I would have thought would have made her a bit more nervous about exposing it. 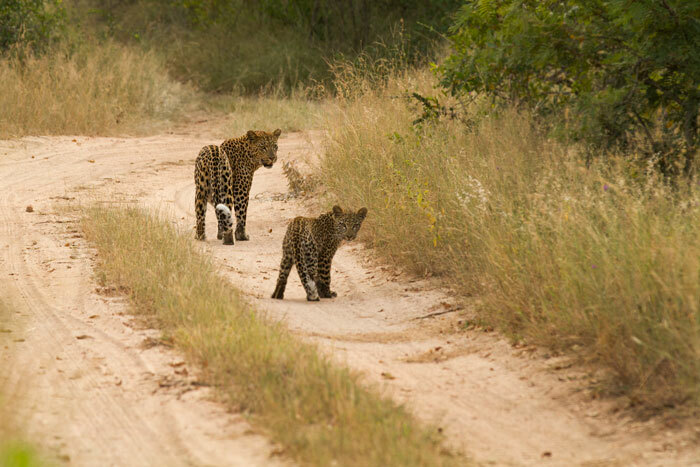 Nevertheless, we spent a magical afternoon with the two beautiful cats, giving the cub as much space as we could, but it was hardly necessary as we were nothing more than an afterthought for the two leopards. As the sun began setting, the female set off for the hunt, leaving the cub in a thicket. We did likewise, not viewing the youngster without its mother present. The next morning, within 200m of where we had last seen her, the Mashaba female was found with a fresh impala kill, evidence of a successful night’s hunt. Recently, the Mashaba female, traditionally confined to the East of camp, has been expanding her territory, pushing further west into an area occupied by the Tutlwa female. These two are technically sisters (the Vomba female is their mother and the Camp Pan male fathered both of them, but they were born two years apart) and as such would hopefully not be too aggressive towards one another should they meet. 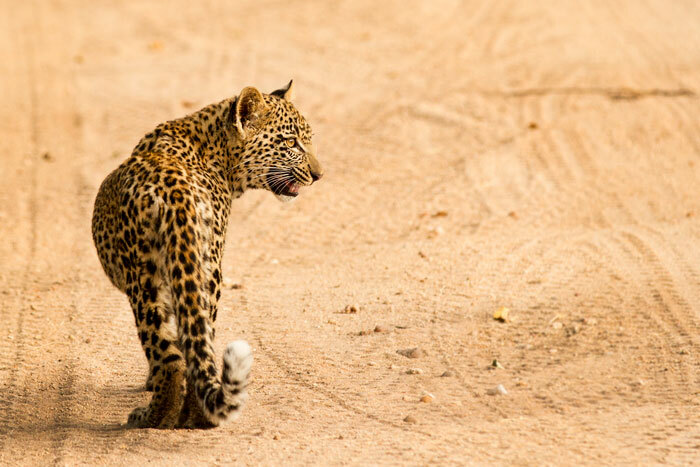 This has not been the case, however, as witnessed recently during a sighting in which the Marthly Male was mating with the Tutlwa Female and the Mashaba female and cub had a kill nearby. With the demise of the Nyelethi 4:4 female in the north roughly 2 years ago and the more recent disappearance of the Maxabene 2:2 female, new areas are up for grabs amongst the female leopard population and the shift in territories has left us scratching our heads in some instances, as individuals pop up in the last areas we would ever expect them! 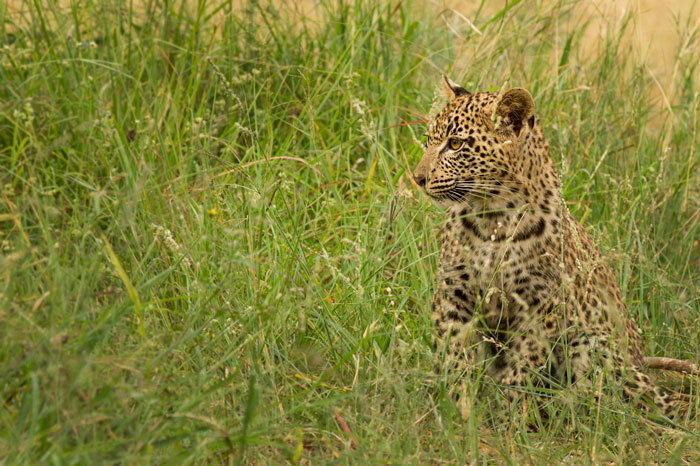 Keep a lookout for an update on the female leopards of Londolozi. How gorgeous, I do hope this little beauty pops up when we come – just over 3 weeks to go, can’t wait. FANTASTIC!!! Gorgeous ladies, both! Thank you! What an amazing post! Thank you James! Amazing. Loved the video. Thank you!! Can’t wait to see these two in a little over a month! What a treat. Great video. Well done James. Wonderful footage! The little one looks so confident as she walks down the track. Looking forward to see her and mom next month! Thank you so much for sharing.. I am not sure if the cubs eyes are really that copper color, or if it was the lighting.. whatever it is those eyes are gorgeous. 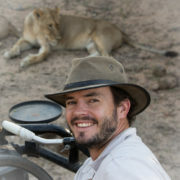 I love these cats and appreciate knowing about their territories and relationships to the other leopards in the area. Wow! !, Incredible video clip. Was just wondering what was going on inside those brains.